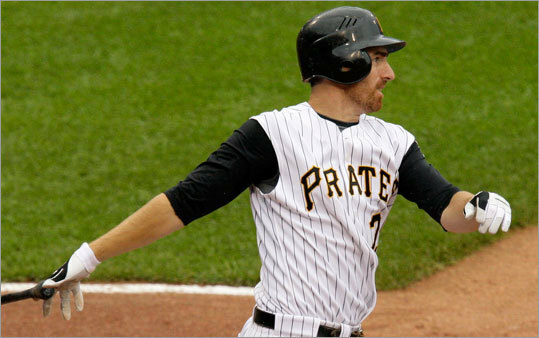 (AP) The Red Sox acquired Pirates first baseman Adam LaRoche in exchange for two prospects. ARLINGTON, Texas - The Red Sox yesterday morning traded two prospects to the Pittsburgh Pirates for lefthanded-hitting first baseman Adam LaRoche, ending a months-long pursuit to bulwark the corner infield positions and perhaps offering a preview for more - and potentially grander - deals to come by general manager Theo Epstein. In LaRoche, 29, the Sox gained a player who provides insurance should Mike Lowell’s health deteriorate and a hitter who should boost their ability to hit righthanded pitching, one of their most glaring offensive issues. Later in the day, the Red Sox cut any remaining ties to shortstop Julio Lugo, whom they traded to the St. Louis Cardinals for Chris Duncan, a slugging first baseman/outfielder who reported to Triple A Pawtucket. The Red Sox designated Lugo for assignment Friday, effectively ending his tenure with the club. The Sox sent cash considerations to the Cardinals to cover Lugo’s contract, and will also receive cash or a player to be named later. While shipping Lugo knotted a loose end, gaining LaRoche gives the Red Sox a piece for a potential postseason run. The Sox gave up Double A shortstop Argenis Diaz and Single A pitcher Hunter Strickland, a package Epstein called a “very reasonable acquisition cost’’ that left the organization enough trade chips to make more moves before the July 31 non-waiver trade deadline. Epstein believes the Red Sox, even with LaRoche, do not possess the depth among their position players as they have in past seasons. A subsequent trade could be for another player who fits a similar profile. LaRoche will join the Red Sox tomorrow in Boston, leaving his younger brother, Andy, an infielder, in Pittsburgh. He will also force the Red Sox to make a difficult roster decision. His addition means a Sox veteran will be placed on the disabled list or otherwise removed from the team; a prime candidate is Mark Kotsay, a lefthanded hitter who plays first and the outfield. Kotsay will meet with manager Terry Francona today to discuss his future. Several current Red Sox have played with LaRoche, who began his career with the Atlanta Braves. Left fielder Jason Bay and shortstop Nick Green described him as a laid-back teammate with a laconic personality, a slick glove, and a strong bat. The Sox are hitting .247 against righthanders, a problem the front office hopes LaRoche can remedy. Epstein and the Pirates had been in discussion for months, he said, and the trade was “not in the least bit a reaction’’ to the Red Sox’ recent offensive tailspin. LaRoche batted .338 at home this year and .159 on the road, which did not concern the Sox. Epstein believes playing in Fenway Park will spur LaRoche to hit balls to left-center, his best and most natural swing. Neither Diaz nor Strickland were considered cornerstones of the Red Sox farm system. Diaz, 22, who was on the 40-man roster, entered spring training widely considered the best defensive player in the Red Sox system. He proved able to make flashy plays, but consistently failed to make routine plays, a problem that followed him to Double A Portland. Diaz committed 18 errors this season. Strickland, 20, pitched for Greenville this season. The Red Sox drafted him out of high school in the 18th round in 2007. Strickland, who is 6 feet 5 inches, went 5-4 with a 3.35 ERA, 51 strikeouts and 13 walks. He throws his fastball in the low 90s. For Epstein, the duo proved easy to part with for adding LaRoche, the second player the Sox plucked from Pittsburgh in two seasons. The first, Bay, made a nearly flawless transition. survey What should the Sox' next move be?